You are currently browsing the tag archive for the ‘floral’ tag. 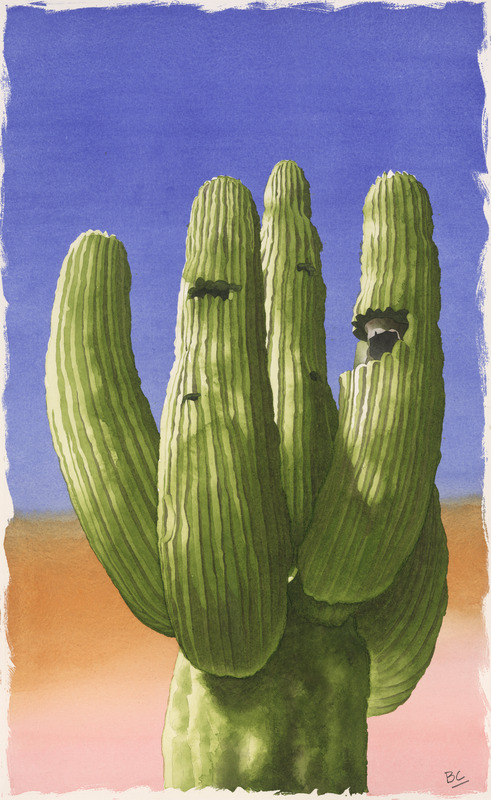 We’ve been living in Arizona for the last 10 or so months and I’ve finally gotten around to painting some of the local flora and fauna. Above is my watercolor entitled HOMESTEAD CACTUS. While the cactaceae (Eh, how’s that? Semi-Latin.) is about 30 feet tall or so, the painting itself is roughly 16″ X 26″, big enough for me. More flora and fauna, as well as babies, puppies, seashells and toasters at my CURIOUS PAINTINGS website. 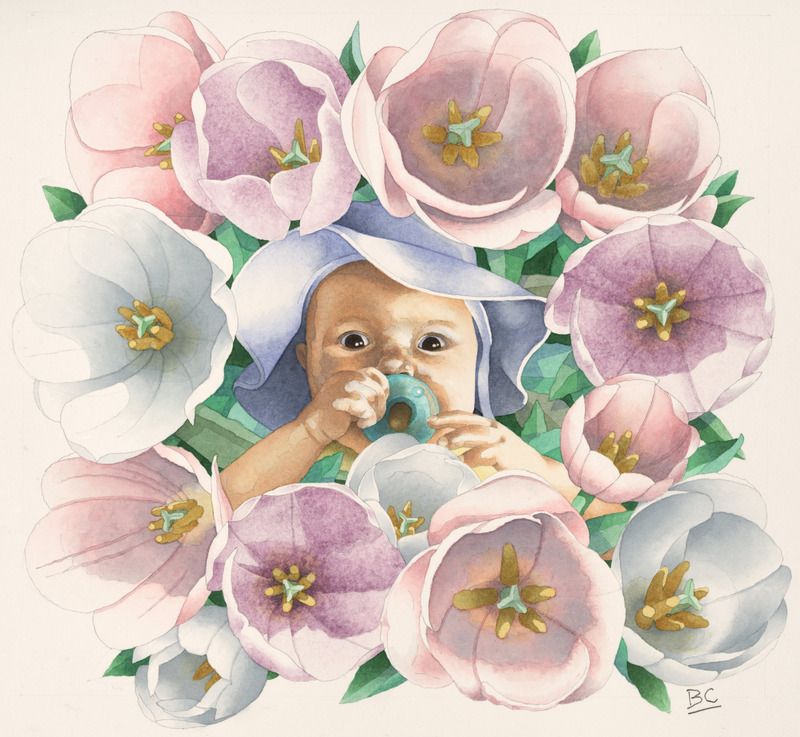 Another watercolor portrait of granddaughter Vivienne; FLOWER BABY. Where do these things come from? I know, they come from my website! Glad I figured that out, this social media stuff is making me anti-social. Exacerbating my natural social hostility actually. Even more watercolors, portraits, cartoons and art miscellanea at www.briancody.com. Blinded by an almost-fatal combination of caffeine and bad taste, I added 28 seconds of colored pen hari kari (do you realize you don’t need to be accompanied by an adult, or show two forms of identification, to buy Pentels in Arizona? Crazy again!) to my ARIZONA CRAZYSALAD LONG VERSION video. It’s the Wild West down here! I’ve most recently become entranced with a newish software app that allows me to, amongst other things, animate my watercolor paintings. 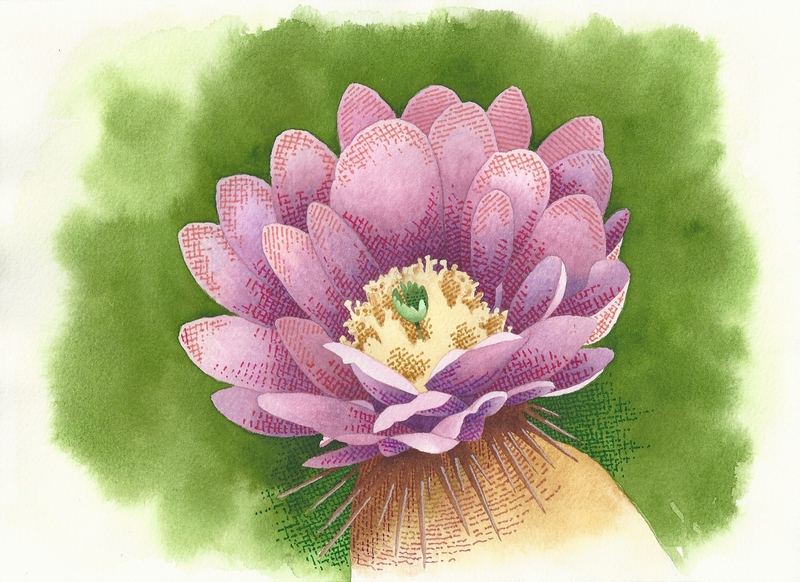 WHAT A GREAT IDEA, ANIMATED WATERCOLOR PAINTINGS!!! Who couldn’t use a painting that moves? “GENIUS!” I exclaim to myself, being sure to keep my voice down because the other thing this app does is enable me to know, even when she’s in another room, when my long-suffering wife is rolling her eyes into the back of her head and sighing that l-ooooooong sigh. Every time the G-word is used in our house, admittedly just frequently enough to provoke a saint to extreme violence, it’s quietly countered with the Einstein quote “The difference between stupidity and genius is that genius has its limits.” Not sure what the point is there but genius knows there’s a market for watercolors that jump about. 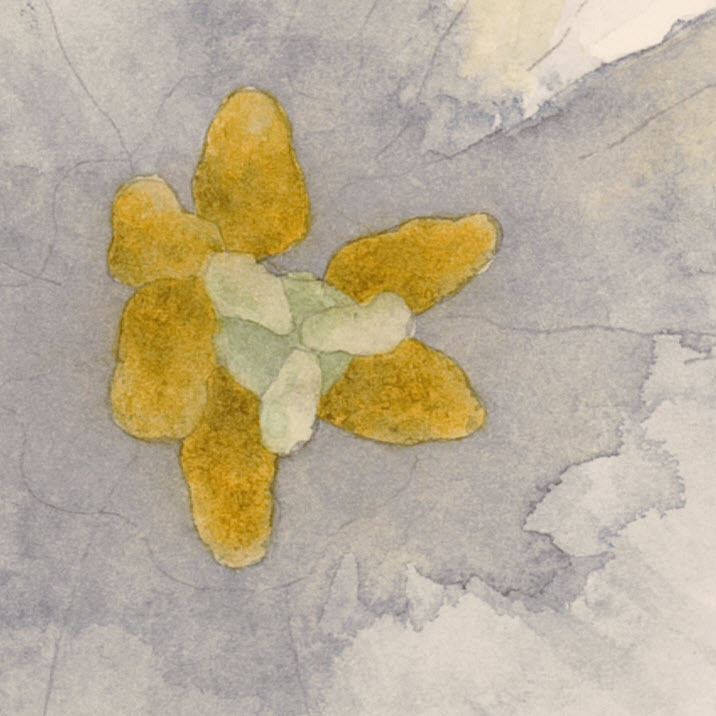 And to that point, here’s the video of my new watercolor paintings, Arizona Desert Flower Crazy Salad. More watercolor paintings, mostly static, family and pet portraits, cartoons and other oddities at my website collection of CURIOUS PAINTINGS. Lastly, any and all of my art can be purchased in a variety of forms – mugs, t-shirts, cellphone cases, mousepads, postage stamps, even skateboards – through my online store Zazzle.com/briancody. 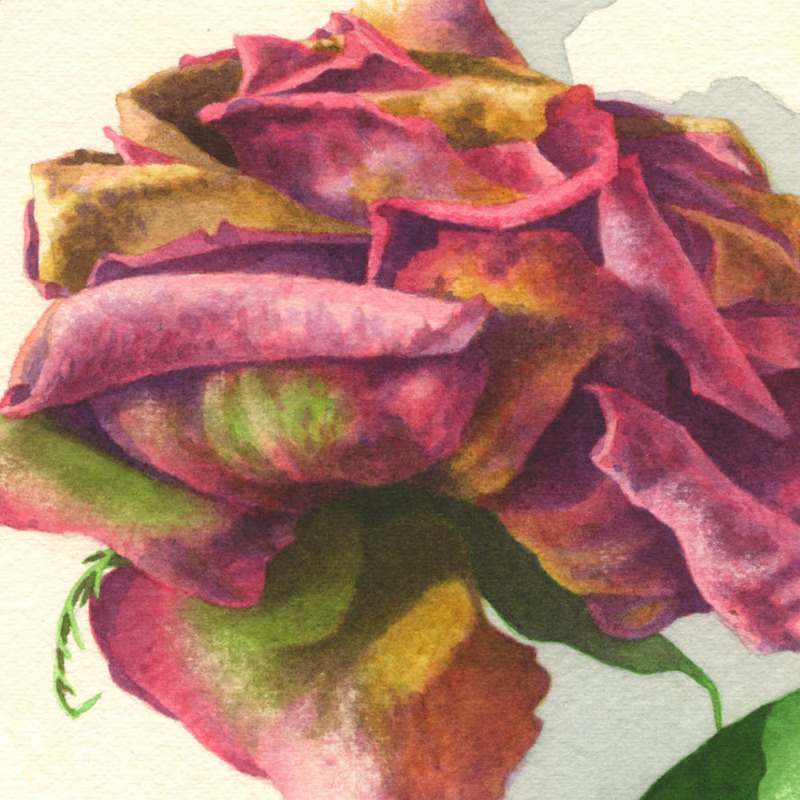 A close-up of watercolors tortured in the name of art. More anguished work in my gallery of CURIOUS PAINTINGS. OLD & IN THE WAY: no, not me, the flowers! Wrinkles are a good thing, especially in flowers. Wrinkles mean you worry a lot. Or someone left you out in the sun and didn’t water you enough. The former has me worrying a lot; about the tide not returning, sun not coming up, about the Pats’ chances in the Super Bowl, no snow, Pats’s chances, too much tide and about what’s for lunch. As for the latter, as a painter, I’ve got a subject matter with character (more than can be said for myself. I’ve got “cranky,” but you can’t paint cranky.) that demands a somewhat focussed rendering, usually with painfully tiny watercolor brushes, sizes #3 – 7 (which begs the question: how come as the brush gets smaller, requiring fewer camel hairs, it gets more expensive? What, the camel trying to drive up demand?) and a massively big bottle of ibuprofen. Combine that with a sense of patience that often times leaves your (poor, long suffering) wife suspecting you’ve passed away at your desk because you haven’t twitched a muscle in 4-5 hours, and you’re ready to render wrinkled flowers! To learn more about aging gracelessly, visit my gallery of CURIOUS PAINTINGS. I’d like to take this opportunity to acknowledge the selfless sacrifices made by dedicated watercolors too numerous to mention in the laborious course of my creating these paintings. 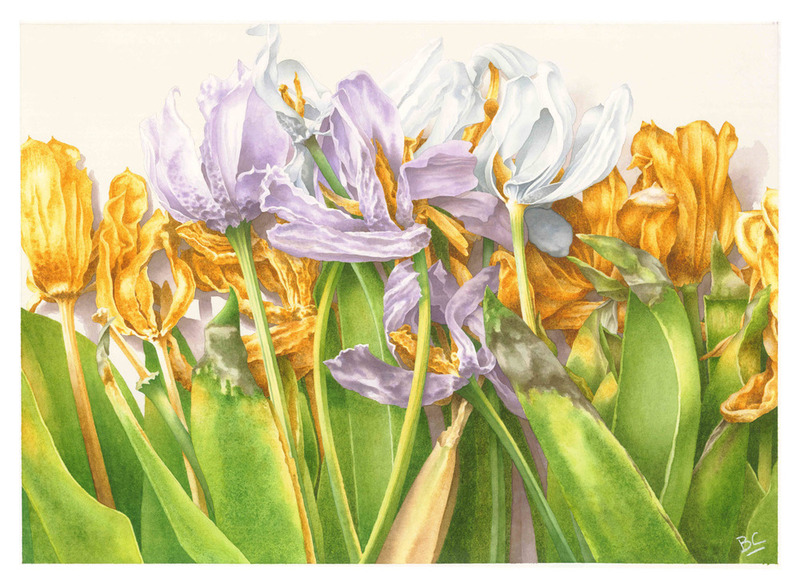 As demonstrated by the detail of TULIP TANTRUM, special attention should be focused on PAYNE’S GRAY and RAW SIENNA as two watercolors in particular who went above and beyond the call of duty. Thank you both, I couldn’t have done it without you. The same can be said for all of your silent peers, MANGANESE BLUE and PERMANENT SAP GREEN and all the rest included, thank you, thank you, from the very bottom of my paint tray. And as a final aside, this was a first for RAW SIENNA. Viewers might know RAW from her work in the adult entertainment industry. 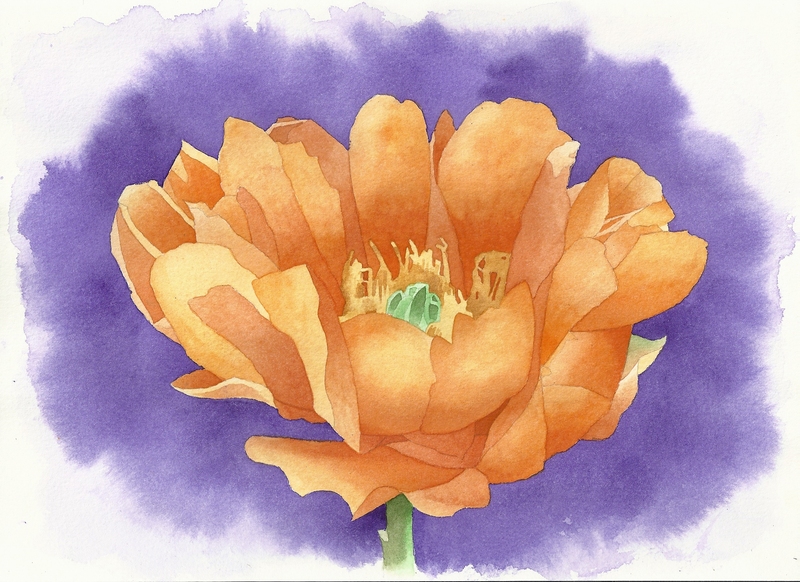 TULIP TANTRUM was her first starring role in mainstream watercoloring and I hope there’s many more like that to come; before you know it, Disney will be next! Agent’s note: RAW SIENNA is changing her name to SERENE SIENNA. Be sure to watch CURIOUS PAINTINGS for more SERENE updates. So what happens to a flower once it passes its prime? Does it do a Jack Nicholson and show up courtside only at Lakers’ games? Hide in Florida with the pink flamingos? Rose Pondering Retirement demonstrates a different approach to aging gracefully by turning a bit crinkly, with its once saturated primary color red maturing into a multitude of muted, complimentary hues. Sort of like me except, instead of crinkly I just get cranky. More warnings of advancing wrinkles and bad temper at my Curious Paintings. (sigh) It’s never good when the flowers turn against you; next thing you know your lawn’s overrun with nasty, ugly weeds. And, if the local vegetable population gets wind, good luck with next year’s zucchini crop (remember: never piss off a zucchini, they’re in everything. Think of an angry zucchini bread for breakfast. Yikes!) I’m still taking a hit for that whole asparagus-in-a-toaster public relations disaster; the damn thing was unplugged! Who knew asparagus had no sense of humor? Or art for that matter. So it’s all a perception-versus-reality thing. I really enjoy the character of a dried flower, I think it does things with filtered light that healthily hydrated, well adjusted blossoms don’t. But try explaining that to a perturbed Red Mum with an attitude, it’ll get you nowhere. 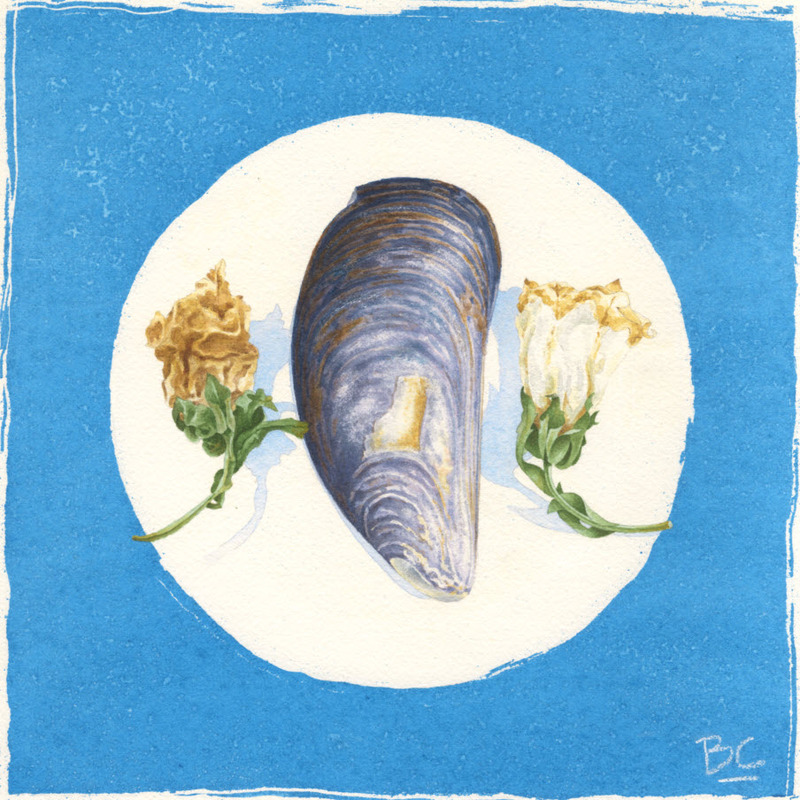 Maybe next to a Purple Beach Mussel but what good is that?